Just remove countershaft sprocket, water pump and shift mechanism cover. Best "drop-in" carb kit available. Most 98-99 ZX-9Rs are OK on the high rpm / full throttle fuel delivery curve. To diagnose absolutely, it's required to run the bike on an EC997 Low Inertia Eddy Current dynamometer WITH the Integrated 4 Gas Analyzer to map the fuel curve to see if there is power to be had by reworking the fuel curve. 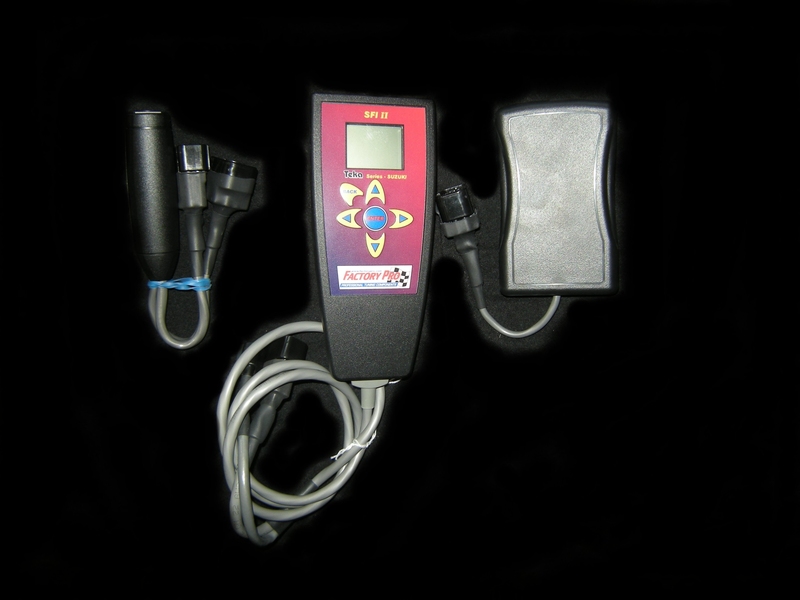 Contact your nearest 4 Gas Exhaust Gas Analyzer equipped Factory Pro Tuning Center. Locations - click here. HDJ showing 6 peripheral micro fuel passageways. 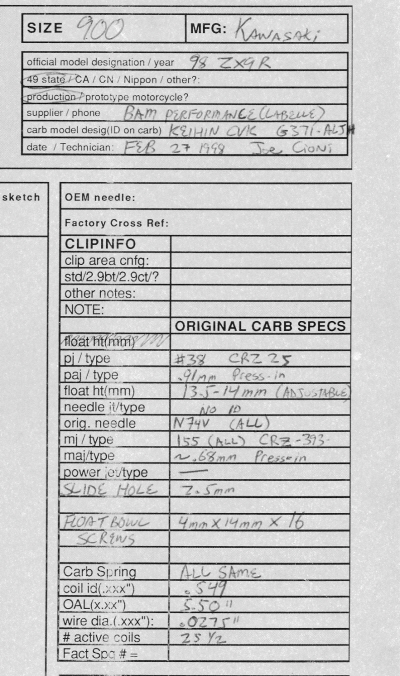 Send in your carbs and we can replace them with patented HDJ style needle jets. 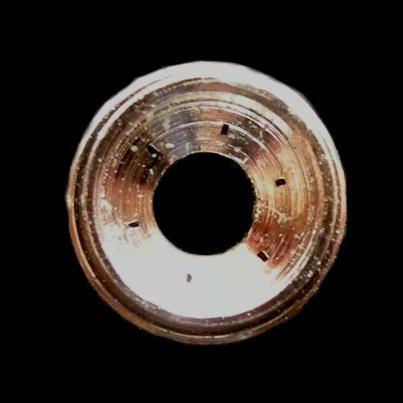 Let Factory Pro replace your worn "non-replaceable" needle jets and convert your carbs into HDJ (High Dispersement Jet) style needle jet carbs. Better throttle response - potentially better mileage - 2% to 5% more power - augmented part throttle response. New HDJ style F-Pro needle jets - featuring Multiple Jet jet fueling, increased acc pump function, high capacity "needle jet well". Better throttle response and better fuel atomization for more power and more fuel efficient power. If that's the case, and you've adjusted and reset the float height leaner and 18mm still isn't lean enough at cruise, and especially if the problem is on 1, 2 or 3 cylinders, please inspect the float valves for the dreaded rubber tip shrinkage. Some fuel additives attack the float valve rubber tip and cause it to shrink and distort. 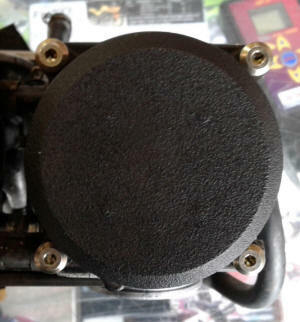 Now, nobody needs a shrunken, distorted rubber and, being non-round, will allow not shut off fuel in the carbs with the bad float valves and cause very rough low speed running (as the fuel level keeps rising in the carb bowl). Adds power at ALL part throttle positions. That equates to more "snap" in throttle response for you! 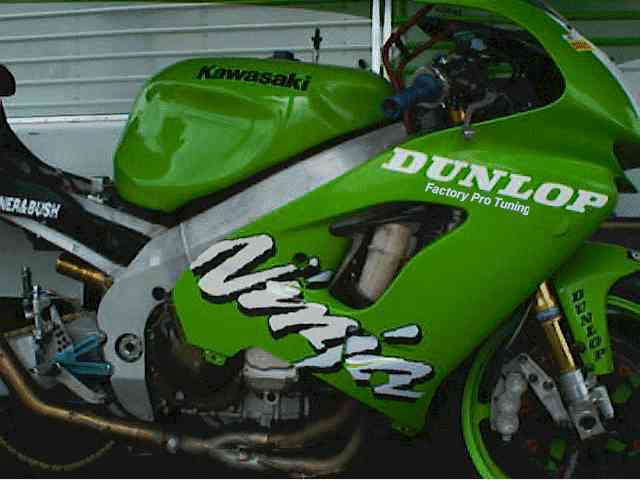 As seen in Sport Rider and Motorcyclist project 2001 bike! Factory Pro and BMC have produced the finest cleanable air filters available. Manufactured in Europe to craftsman's standards, if any filter would last 1,000,000 miles - these would! For race or street use. Absolutely the strongest cover you can buy. Highest strength / weight ratio available. Can be show polished to a mirror finish. Includes: gaskets, if required, and replacement stainless steel allen screws, as required. Make shifting quicker and virtually eliminate missed shifts when it's done. Not as elegant in feel as the above Shift STAR kit, but will certainly help with missed shifts and damage caused by missed shifts. Until the Shift Star kit was released, this was our premier kit. The only way to accurately measure float heights. Works on nearly every carburetor. Float height measurement affects the fuel level in a carb - Fuel level controls the amount of fuel that the carb delivers at low rpm and cruise. Sorry it took so long to get back to you, things have been a little busy around here. Here's a run down on what's happened. I bought myself a 98 zx9r race bike last year and from the get go it never ran well. It had a full Akropovic system, factory pro jet kit, factory pro ignition advancer and some headwork. The problem was it would hit a flat spot at around 10,000-rpm and then flatten out and not make anymore power. I took the bike to a local "professional" Dyno tuner who uses a Dyno jet dyno to tune bikes, he said it was running lean and it would need re-jetting. No problems I thought, as he told me it was running 150 mains which is smaller than stock. When I picked the bike up he told me he had put 155 mains in it as that what the dyno and exhaust analysis said was "correct" (A/F Ratio..), I thought that was a bit strange as 155 mains are what is in a stock zx9r. come back on at about 12,000 rpm for about 100 revs then hit the rev limiter. This gave a peak hp of 140 at 12,000 rpm but was obviously unusable. I was told that they could not get it to run clean to redline as the ignition advancer was causing the problem and I should go back to a stock rotor as they did nothing anyway. My next time out on the track I found the bike to be so difficult to ride that I ended up putting the stock rotor back in to see if it made any difference. It did and the bike revved out a lot smoother and cleanly to redline but it lost a lot of punch, seemed lazy out of corners and wouldn't accelerate as hard. I couldn't believe that was right. difference, it ran clean to redline and pulled like a freight train. I recently had it in on another dyno to check the hp and with no other mods than the "correct jets" and Marc's advice the bike was putting out 143 djhp and ran clean to redline. Both dyno sheet pics are attached. My times at Eastern Creek Raceway have dropped from a best of 1:48 with the bike as tuned by the "Dyno pro's" down to a 1:42's and suddenly I'm competitive. On another note, I was having a lot of problems with false neutrals so I installed a Factory Pro shift kit. At first I thought it was a bit a pricey for what it was but, wow, what a difference, I have hardly missed a shift since putting it in and the speed of gear changes is much quicker. I'm sure that had a hand in the improved lap times. Do you have a ZX9 with worn needle jets? 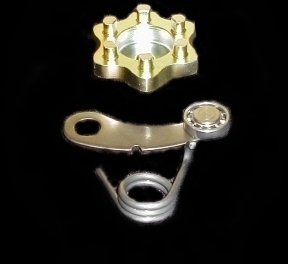 How to check: http://www.factorypro.com/tech/needle_jet_Mikuni.html. Are your needle jets silver, black or brass colored? Are they worn? Have you experienced increased low rpm richness over long term mileage? What is your float height? Click here to report year, date of manufacture of the bike and mileage and what brand of jet kit that you have installed, or stock. 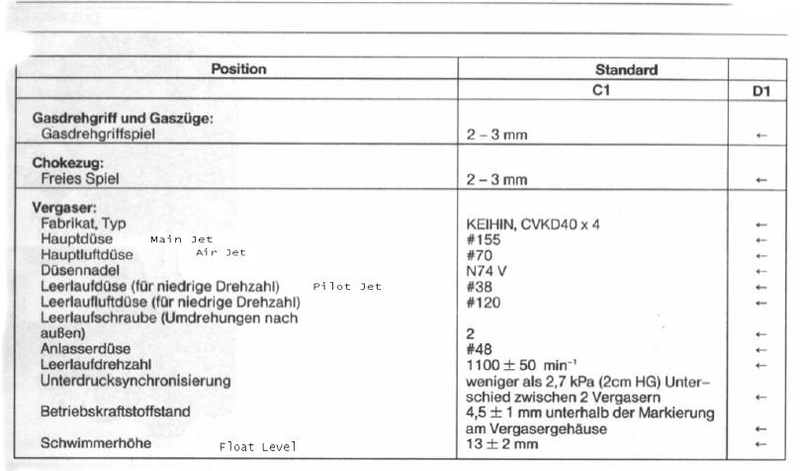 If you have a jet kit, at what mileage was the kit installed? That's an important question that we are working on an answer for. 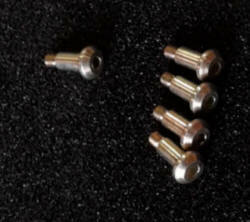 We can replace the worn needle jets in the carbs, cost $350. Persistent missing at high rpm? Anti-Theft Alarms? Regardless of main jet selected? All air correction plumbing is properly connected? - the bike still misses at full throttle / high rpm. And you have an "alarm" installed??? Disconnect the alarm and retest. As of October 24, 2001, there have been many reports of alarms causing high rpm misfiring. Disconnect the alarm and the problem goes away. It can be present when you install the alarm, may start after a crash or sometimes, just "occur". Call the alarm company to discuss that with them!